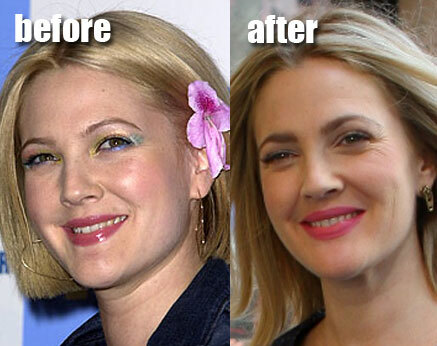 Drew Barrymore before and after plastic surgery and breast reduction? Drew Barrymore is that super cute American actress who has literally grownup before our eyes on the big screen, showcasing her early acting ability during the 1980s with her role in such films as E.T. the Extra-Terrestrial and Firestarter. And like with many prominent actresses in show business, as they age, its simply a matter of time before rumors of plastic surgery begin to swirl around the ol' rumor mill. In fact i stumbled across numerous gossip blogs that suggested Ms. Barrymore had undergone both brow lift and eye lift procedures, along with suspicion of having breast and chin reduction surgery, for the better part of the last half decade. Let me be the first to say, these plastic surgery allegations are extremely far fetched, and i have yet to see any before and after pictures that would suggest any facial alterations whatsoever. And as for the breast reduction surgery rumor, the obvious culprit appears to be a combination of push up bras and weight loss. Case closed ladies and gentlemen. "I just know it's a slippery slope, and everybody's starting to look a little waxy lately. I'm going to do everything I can not to go down that road." "I'm so curious as to what's going to happen naturally that I can't imagine wanting to alter things just yet." "I don't want to be vain or fearful, and I don't think I'll do anything, but if I want to do something, I will. From my perspective, there's no reason to be afraid of aging, because if you age, you're lucky! The alternative is death." It seems like Drew left a slight window of possibility open for future plastic surgery, however up to this point in her life, the darling actress looks to be 100% natural. But do you think Drew Barrymore will ever go under the knife and join the ranks of fellow celebrity plastic surgery specimens? Drew Barrymore DID have breast reduction but it was years and years before the photos shown(black bikini) were taken. She admitted openly to it because she had such large breasts. She never had implants or implants removed, but had a reduction. I don't know if she's undergone a second reduction, but when one does so it's less for vanity reasons and usually due to back aches and things of that nature.